← Previous: See Brod at the 2015 ILA Conference in St. Louis! 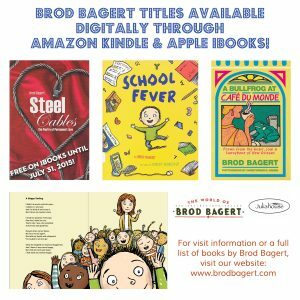 You can now buy three Brod Bagert books in digital format through Amazon Kindle and Apple iBooks! Adults and children alike can now enjoy Brod’s poetry on your e-reader or smartphone! The best part: we are offering Brod’s book of love poems, Steel Cables, for FREE through July 31, 2015 on Apple iBooks!